Carolina Hurricanes Recap on Blue Jackets and Flames Games!! Playing 3 games in 4 nights the Carolina Hurricanes have kept a 6 game point streak alive and have won 5 of their last 6 games. Extending a 3 game win streak on Friday night to 4 games then going to Washington to loss to the Capitals with 14 seconds left in OT. After a well deserved day of rest the Hurricanes were back in action Monday night against a “Flaming” hot Calgary! 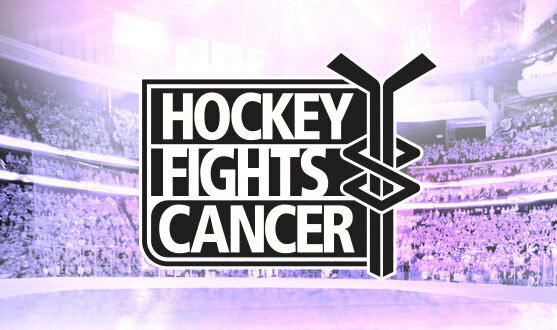 Friday night again the Blue Jackets was more than just a hockey game, it was also the Hurricanes time to show support for the league wide Hockey Fights Cancer. There were 7 local cancer awareness charities that were in attendance that got a donation from the Hurricanes organization. 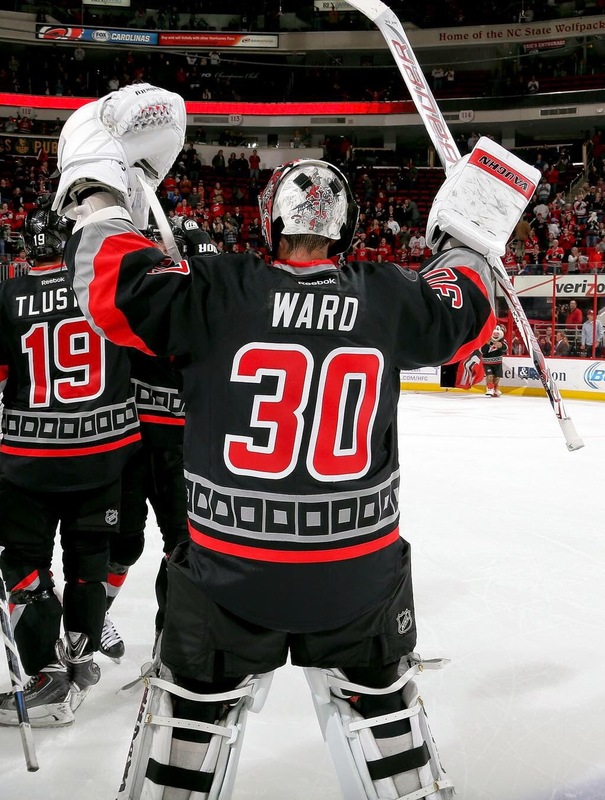 The Hurricanes fought back to push the game to overtime with another great performance by Cam Ward. With 37 seconds left in OT Elias Lindholm once again lit the lamp for the game winner! The Hurricanes then took a quick flight to DC where they would face a familiar face in Justin Peters between the pipes for the Capitals. Once again for the second night in a row the Hurricanes were playing from behind; but with the persistence this team has been playing with lately they battled back to push the game to OT and get another point in the standings. Even though Ward got a well deserved night off, Dobby played a good game till 14 seconds left in OT when Backstrom cashed in on a rebound from a heavy Ovechkin shot. Sunday practice was canceled at RCI and when the Hurricanes returned to the ice on Monday they were ready to go looking for 2 more points. Cam Ward looking for his 5th win in a row as the started got his wish by stopping 22 of 23 Calgary shots. Justin Faulk had a big night getting the game winning goal as well as 2 assists. 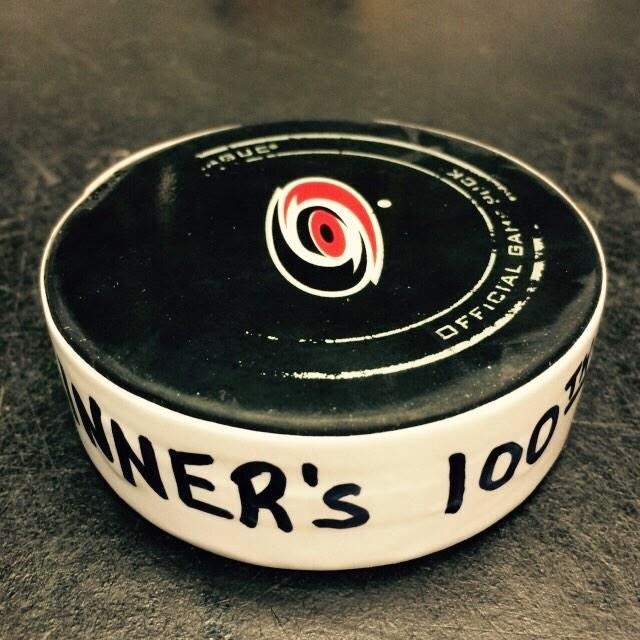 Tim Gleason collected his 1st of the season with a great set up by Jeff Skinner. Skinny had a big night as well with 1 assist and 1 goal!! That goal turned out to be his 100th career NHL goal. The Hurricanes have seemed to turn it around after a HORRIBLE month of October and are starting to find their identity as a team. Hurricanes play again at PNC on Thursday night to face former coach Paul Maurice and the Winnipeg Jets.